This soup was a mainstay in my house when I was growing up. The end result is thick, delicious, and happens to be exceedingly healthy and fat free. The total ingredient cost, assuming you've already got the spices, is around three dollars. Also happens to be vegan, but don't let that scare you off. This soup disappears from the fridge faster than any of the other soups I've made this year. Rinse the peas throroughly, and put them in a large soup pot with the water over high heat. Meanwhile, chop all the vegetables and add them to the peas. Add the spices. Lower the heat so the soup is just at a simmer, and let it cook, stirring ocassionally, for about two hours. 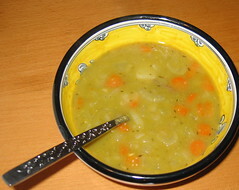 The split peas should completely dissolve and the soup should thicken. Taste, and add salt and black pepper to taste.